The University of Virginia School of Law has created a new interactive web resource (click on map) that allows researchers and the public to visually explore death-sentencing practices in the United States from 1991 through 2017. The interactive map provides county-level data on death sentences imposed across the United States, drawing from a new database created by University of Virginia Law Professor Brandon Garrett (pictured) for his recent book, End of Its Rope: How Killing the Death Penalty Can Revive Criminal Justice. The interactive map, which is a web supplement to the book, permits users to view where and how many death sentences were imposed in the U.S. each year, and to contrast and compare sentencing patterns over time in states, counties, and the U.S. as a whole. Using a slider to view chronological shifts in sentencing patterns, the map illustrates how death sentences have declined nationwide and become increasingly isolated to a few outlier counties. "This is the first resource to map out modern death sentencing in the United States," Garrett said. 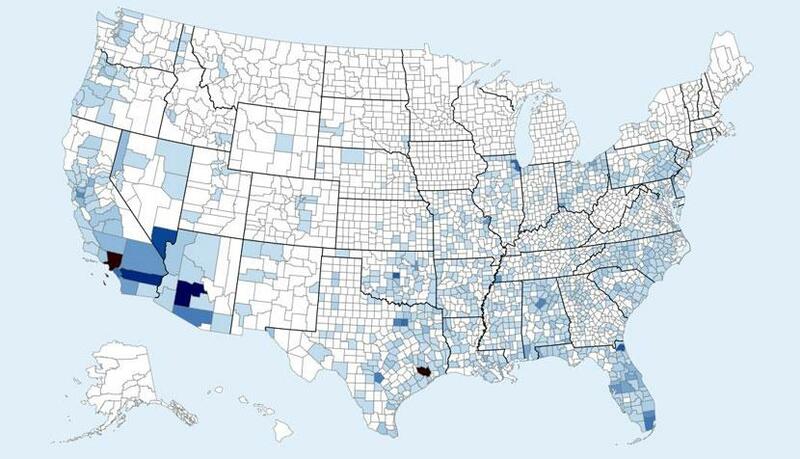 "The mapping vividly shows how geographically isolated death sentencing has become." The data forms the backbone of End of Its Rope, in which Garrett analyzes the dramatic decline in the use of the death penalty over the last 25 years. The publicly available database contains information on more than 5,000 death sentences, allowing researchers and lawyers to analyze patterns and trends. "Several researchers, in addition to those of us at UVA, have already made use of the data, and we hope that more do so in the future," Garrett said. Garrett worked with a UVA Law librarian, law students, and undergraduates to compile the data from government records, court rulings, and other sources. (Eric Williamson, Mapping the Modern Death Sentence, University of Virginia School of Law, March 27, 2018.) Explore the interactive map here. See Books and Sentencing.